I am super excited to try this. I tried the powder, but it didn’t work too well for us. You are so awesome! I am wondering what you feed your dogs and chickens. I am also curious what you use to wash delicates and can you create a liquid detergent? I am so grateful for you and your community you have created. It is quite stellar! Awesome! I am so making this when my un-green detergent get used up. I was hoping you’d do a post. My green house cleaning bible “Clean House Clean Planet” by Karen Logan doesn’t have a recipe. Thanks a bunch! @Amy I use Dr. Bronner’s Sal Suds as my liquid clothes washing detergent. It is cruelty free (even has the leaping bunny logo), uses natural ingredients,is biodegradable, and the container is recyclable! It does use coconut oil based SLS. It’s probably not 100% green but its the closest I can find. You can get it at Whole foods are any store with a big enough Dr. Bronner’s selection. It has a pine smell to it, but it goes away in the dryer. I have not tested it on delicates. I love you! :) I have been looking for a good one for awhile. I tried a dry one with borax and washing soda and it sucked :( The dishes didn’t come clean. Thanks so much for this recipe- it certainly is timely! We’ve been using your powdered recipe, but my dishwasher works MUCH better with liquid cleaner. Wooooo! Ahhh, this post has perfect timing! I’m just about to run out of my current liquid detergent, which I really don’t like, and I was trying to think of what brand I should try next. I am definitely going to make this. Thank you! I’ll have to try this after my current batch of hard water safe dishwasher detergent runs out. Thank you Sayward! you so totally rock! i have to drive across town when i run out of my current green dishwashing liquid… i always have all these ingredients on hand, so double bonus for convenience! thank you a million times over! Awesome! I’m really, really excited to try this. The powdered version didn’t work for us – it left a weird residue on anything glass – tuperware, mugs, and glasses. Thanks for posting this! I really enjoy the powdered laundry detergent, and I’m still crossing my fingers for a liquid version of that too! @ Amy Petz – We feed the chickens an organic scratch but they mostly free-range the backyard. The dogs are currently on a store-bought bag food, but I hate that and I plan to start making their food this sumer. I’ll definitely write about it when I do! I am investigating a liquid laundry detergent. Wish me luck! I use my regular detergent for delicates (it’s really so mild), but then again I don’t have anything that’s *super* delicate. Thanks so much for the support – I’m so glad you like the site! I just wanted to mention that I used your “homemade drain-o” recipe this afternoon on our bathtub and bathroom sink. I have to admit that I was skeptical, but WOW! It totally did the trick! Now this baby-packing lady doesn’t need to worry about nasty drain unclogging chemicals! I used the homemade drain-o, too, today and it worked fabulous! I was so excited! I can’t wait to try this in my dishwasher now! 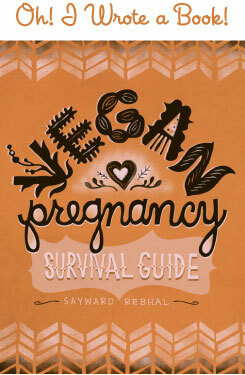 Sayward, the dogfood, is it vegan? Also, Arm & Hammer does animal testing. It makes me sad considering its such a popular brand that a lot of people, who try to live naturally, rely on. I don’t use it any longer. I use Bob’s Red Mill’s baking soda. It’s fairly cheap to buy online if you can’t find it around your area. (I know you’d be able to find it without a problem. ^_^) A 25 lb. bag costs $20.00. Tangergreen seems to be advertising Bob's Red Mill but in honesty, I love buying from this company. I love their whole wheat flour and baking soda. ^_^ And they are located 15 minutes from downtown Portland! Lucky Sayward! (That's it, I'm moving to Portland) lol. It's too bad I can't find local companies besides arm & hammer (located in PA) to buy my cleaning supplies off of…because I definitely would! Just what I needed – the powdered wasn’t working for us. Can’t wait to try this one! A million thank-you’s! Do you think it’d be fine to use this as dishsoap? I have very hard water (just moved to San Diego), and none of my homemade cleaners work! I’d love to give this a try for handwashing (no dishwasher here). I may have to see if my friends, whose house we live in, would be willing to try it. I’d love to start getting them on more eco-friendly, and cheaper, options before we move out. @ Christy – Yep, I’m sure it would be safe and I bet it’d work great. But you may want to try just watered down castile soap first – that’s what I use for hand washing! omg, fantastic! i’ve tried many things for the d/w but none have been successful. we have very hard well water (but oh-so tasty to drink!). i can’t wait to give this a go! yippee! @ Salekdarling – Whoops! Somehow your comment got caught in my spam filter – sorry for the tardy reply. Yay! So glad you got the undies + goodies. And thanks for spreading the word on Arm & Hammer. I recently learned about their animal testing policies and I will never be buying from them again. I love Bobs Red Mill! I plan to visit the factory and restaurant – they have a vegan breakfast menu!!!!!!!! SO NOW HOW DO WE MAKE THE ABOVE MENTIONED DETERGENT? EEK- WHO ELSE MAKES SAFE WASHING SODA? @ Rachel – I’m looking into it! Not a lot of luck so far, unfortunately, but I’ll keep you all updated . . .
You can make baking soda into washing soda. Spread some baking soda on a baking sheet and bake it at 400 for about 30 minutes. :) So, just use the Bobs Red Mill brand instead and make your own. @ Lara – I’ve heard about this! I need to investigate farther, thanks for the reminder! Our dishwasher is over 25 years old, and we don’t have a separate rinse compartment. We do have an extra pre-rinse box, but it doesn’t have a lid or anything so its basically useless. How should I add the vinegar in this case? I use vinegar currently, and I just pour some into the compartment with my powder detergent. Would it be possible to mix vinegar into this recipe or should I just add some to each load? I know the two other people in the house would find it easier if they didn’t have to add two things. Love your site. You’ve inspired to me to try things I would never have thought of! @ Trish – Yay! I’m so glad you like it here and you’v found some useful info. Just wanted to let you know that I’m finishing up my first batch of this and it worked great. With our hard-ish water, it was a big improvement over the powdered recipe. And I did it unscented and love it! @ Trish – Hooray, that’s great news! I have been buying “green” products at quite an expense. We’re (like so many) on a budget, but I can’t buy the commercial products with a clear conscience. 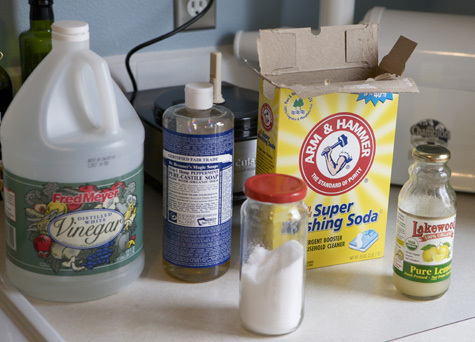 Recently, I’ve been on a quest to make my own cleaning products, many of which call for washing soda. The only brand I can find locally is Arm & Hammer. Are you aware of a brand that doesn’t test on animals? It’s another sticking point with me, as I strive to patronize companies that are cruelty-free. Thanks for the great recipes and tips! Ah, I’m sorry to report that I have to stop using this recipe too. Like the powder, it worked well for a while, but the results got worse and worse. Now we’re getting a greasy film on everything that it difficult to wash off. I’m thinking it must be some kind of build-up in the machine over time? Anyway, I’ll be first in line to try any other recipes you might come up with. I hate having to go back to a commercial brand. @ Jackie – Washing soda is such a tough one! It’s the one and only ingredient I haven’t been able to confirm cruelty free. If you do find something, PLEASE PLEASE PLEASE let me know! Luck! @ Trish – Aw bummer, I think so much of this has to do with your machine and your water quality – there seems to be tons of variance. Sayward, I have tried the powder version and I have had trouble with a powdery film (sadly! I was so excited…I’m off to try out the liquid version tonight). I see that you added lemon juice (a.k.a citric acid!) to the liquid version and I thought you might be interested in frontiercoop dot com because they sell all-natural powdered citric acid which may improve on the powdered detergent for some folks (i’m sure there are other places too). I think some natural food stores also sell this in the form of a powder used to keep fruit from browning. Hi, my first time to this site and it’s great. Just to let everyone know, I use sodium carbonate (washing soda, essentially). I can never find Arm & Hammer washing soda, so I purchase sodium carbonate in the pool section of my store. I’ve never thought to check it’s animal testing policy, but just thought I’d throw out another option for those wishing to give up Arm & Hammer. ps: I didn’t have luck with the powder version cleaning so I am really hoping this liquid recipe works!! in the process making the liquid dishwasher detergent I wasn’t able to completely dissolve all the ingredients while it was on the stove. It kind of curdled. When I used it in the dishwasher 95% of the dishes were clean and looked fantastic. The 5% that didn’t come clean were glasses and silverware. Some of the glasses had what looked like small bits of dried dishwasher powder on them, and some of the silverware had greasy marks and bits of dried food stuck to them. So all of my glass items came out amazingly clean, not all of my plastic items were covered in a gross cloudy film. Any ideas? @ Beth Wakefield and Michelle – Seems like a lot of people have mixed success with this recipe. I think a lot of it has to do with the dishwasher and the water quality (hard, neutral, or soft) Wish I had more helpful advice. Sorry! Love trying this fun stuff!!! After 25 plus years our KitchenAid stopped. it turned out to be a TCO fuse. We had used the powered soaps in most of those 25 plus years. I put in several quarts of vinegar and holly cow. Caked up soap broke free. Don’t know if I damage the machine yet but it has a noise or vibration that wasn’t there before. Heat up your powered soap as the dish washer water isn’t hot enough these days. I’m using TANG on my first rinse as this is missing on the newer machines. Finish off with Distilled vinegar on your final rinse. I just tried this and I am wondering if it will thicken up? Is it a gel or a water like consistency type of solution? 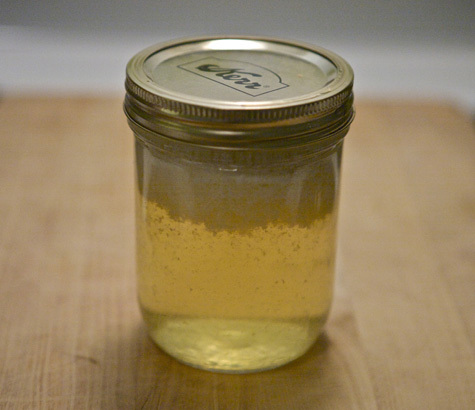 Also, I made some homemade liquid detergent from the “Duggar Family Website” Have you heard of it? We just made 5 gallons of concentrated laundry detergent from the Duggars Family website. It works great. Im making this for the dishwasher next. I love saving money and knowing what goes in the ingredients. Did you use the white vinegar in the rinse holder? It will not thicken to a gel, it’s pretty watery. It separates though, so make sure you shake it before each use! Anyway, I so wanted this to totally work and it does. After I tripled the recipe and saw the separation I placed my immersion blender in it for a half a minute and Sayward! It’s staying all white…meaning the immersion blender blended them together so well that the majority of it is a less chunky white with only a little liquid at the bottom. And they are staying together. Let me know what you think? I have bought all the ingredients for this soap. But I cannot find the Castile soap anywhere. Is there something else I could use as a substitute?